The FT-857D, the world's smallest HF/VHF/UHF mobile transceiver, provides base station-type performance from an ultra-compact package that's ideal for mobile or external battery portable work. Wide frequency coverage, outstandig receiver performance, and the convenience of optional remote-head operation make the FT-857D the expert's choice for high-performance mobile operation! Measuring just 6.1" x 2" x 9.2" (155 x 52 x 233 mm), the FT-857 is the world's smallest full-power HF/VHF/UHF multimode transceiver! Its rugged case design is a masterpiece of ergonomic design, with often-used switches and knobs conveniently positioned for easy access. 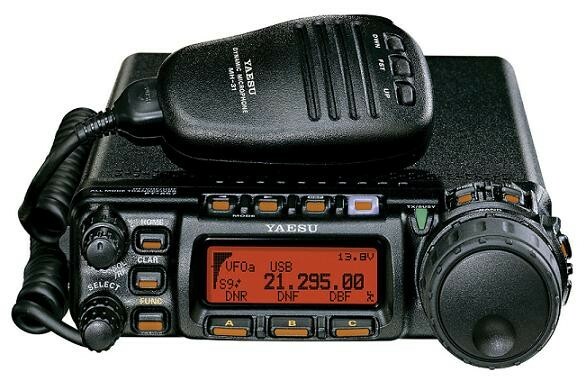 Building on the acclaimed performance of the FT-1000D, Mark-V FT-1000MP, and FT-897, Yaesu's engineers have crafted the FT-857's front end for a very low noise floor, along with wide dynamic range. Utilizing an up-conversion architecture for HF with a first IF of 68.33 MHz, the FT-857 features a double-conversion superheterodyne system (triple conversion on FM), with the 2nd IF at 10.7 MHz. Extensive bandpass filtering in the front end, along with careful device selection and gain distribution, yield a receiver system ready for the strong-signal challenges of today's crowded bands! The FT-857 provides up to 200 "Main" memory channels, each of which may be named with an Alpha-Numeric label of up to eight characters. These 200 Memories may be separated into as many as 10 Memory Groups of 20 Memories each. For added convenience, you also get a "Quick Memory" and a "Home Channel" on each band, plus ten pairs of band-limit memories, to let you restrict operation to a sub-band, if you like. 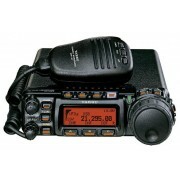 For superior interference rejection and transmitter "talk power," the FT-857's optional DSP circuitry enhances both sides of the communications circuit. The FT-857's DSP Unit features a 24-bit high-tech D/A chip for signal processing. Included are Bandpass Filter, Auto-Notch, and Noise Reduction filters, along with a Microphone Equalizer. Ease of operation of the FT-857 is enhanced by the large-diameter (1.7") Main Tuning Dial, similar in size to the tuning knob of many base station rigs. Selectable tuning steps of 2 kHz/4 kHz per revolution allow easy navigation around your favorite bands, while important keys and switches are strategically placed around the front panel for quick access.